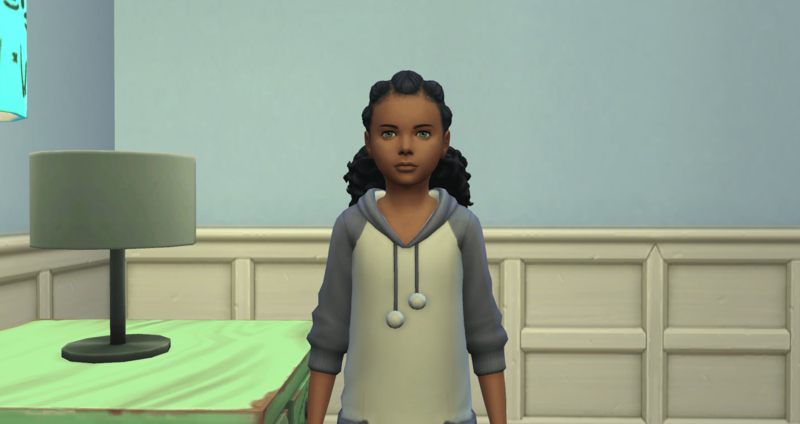 I forgot to mention before that the kids can be found on the gallery once they move out. They can be found under #boolpropnet and #grace100 or under my EA user ID tsmetana or under their individual name. 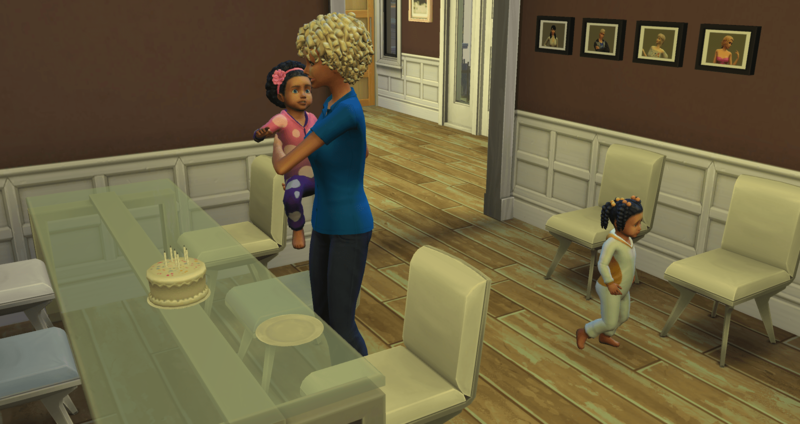 While Merry was picking on the twins, and bringing in the next baby, Catalina AND Jamaica were bringing home promotions. Yes, that is right. Not only did Catalina get her promotion, so did Jamaica. 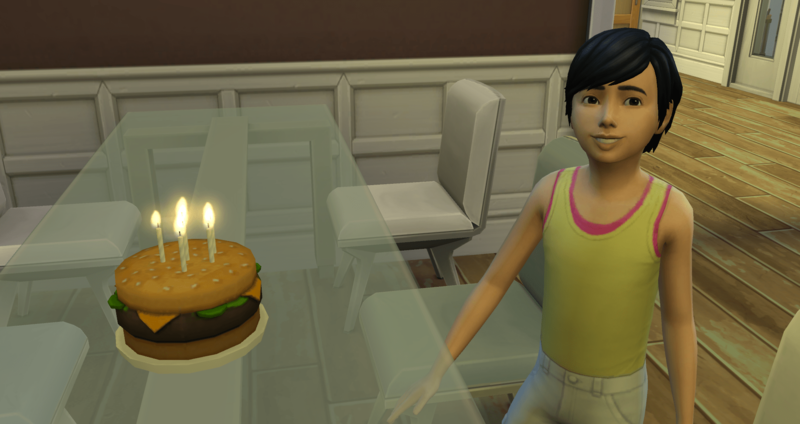 So we are going to start off this update with birthdays and good-byes. 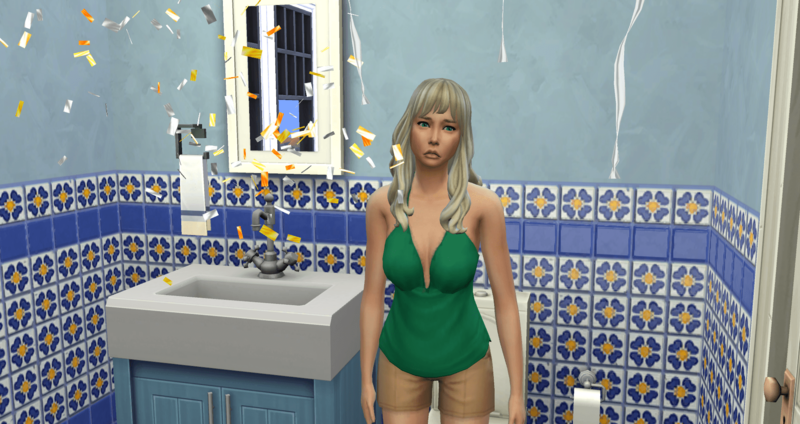 Gambled and Lost: Mmm… well this is embarrassing… Catalina tried to fart while her bladder was low and… uh… hmm… an accident happened. But most importantly, Catalina gets to drink the vampire cure. After she took a shower. My belly is empty… isn’t there supposed to be a baby in here? Have patience, Merry. We don’t even have the next baby daddy picked out yet. 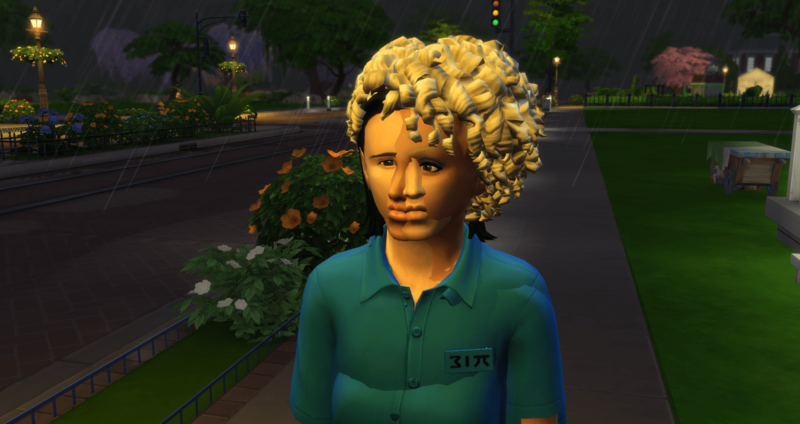 With Catalina ready to move out, we move on to Jamaica. Her processing is a little easier, she just has to blow out the candles. 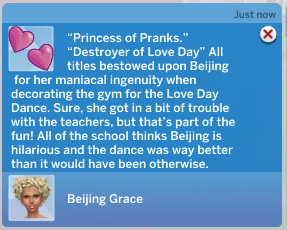 AND, Beijing brought home her elementary school A, earning herself a chance at the birthday cake also. No one actually gets to eat the cake. It is just for show. 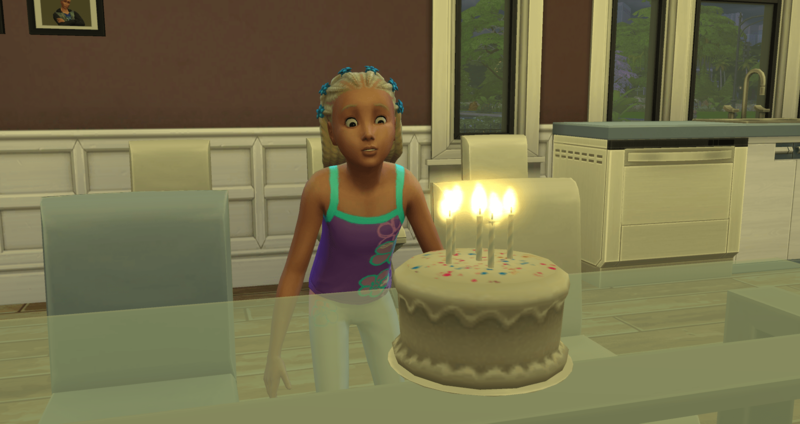 It spoiled right after she blew out the candles also. Beijing adds Vegetarian to Self-Assured and rolls Bestselling Author. 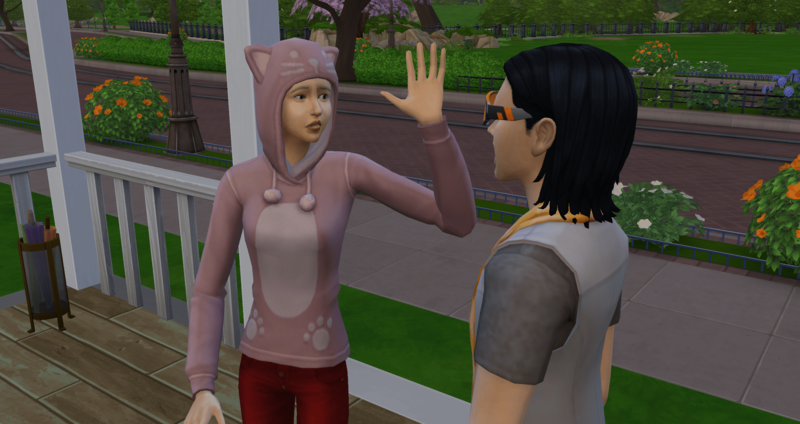 Catalina and Jamaica have moved out – they are in the gallery now. Everyone was dumped out on the sidewalk, so they all head back into the house to do whatever they were doing before. Mecca still looks pissed and Miami is still upset. Austin is in his own little cheerful world. 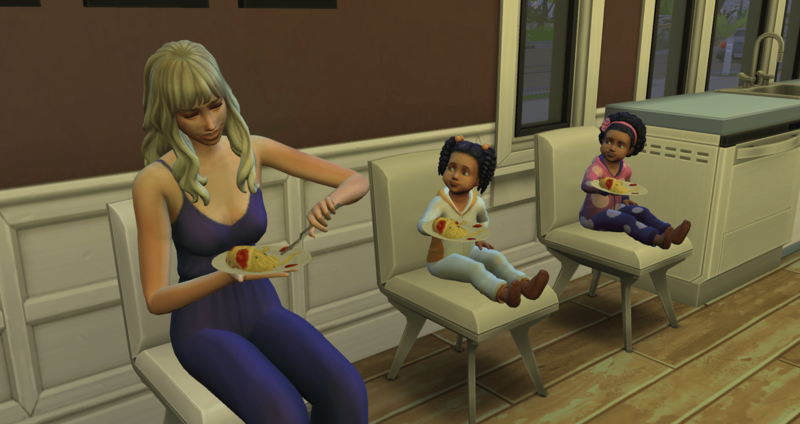 For Merry and the toddlers, they are going for the food. Merry has been making nice, telling stories, and generally being pleasant. Maybe because she isn’t in labor. Merry also needs to get a baby in her belly. 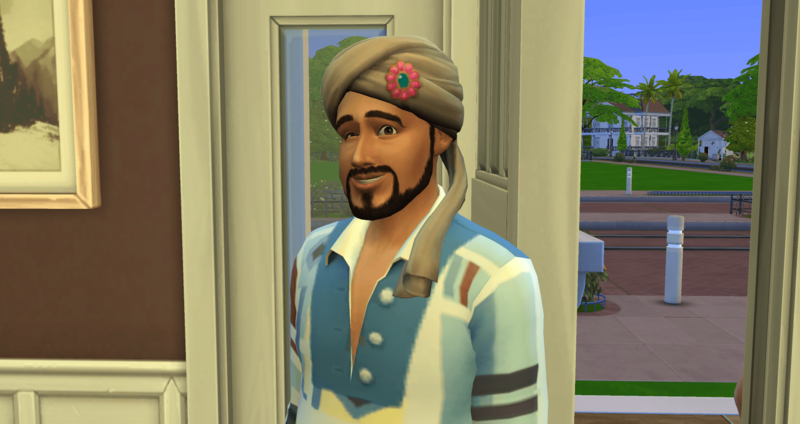 Raj is the next lucky sim to “walk by”. 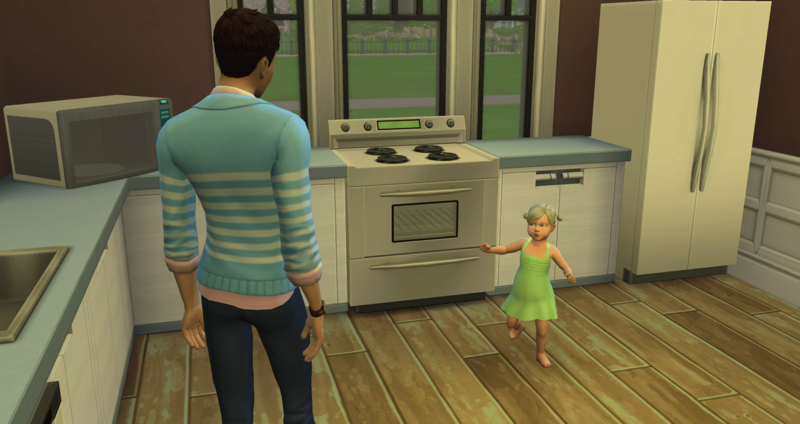 They move quickly past the introductions into going steady… or whatever they call it. 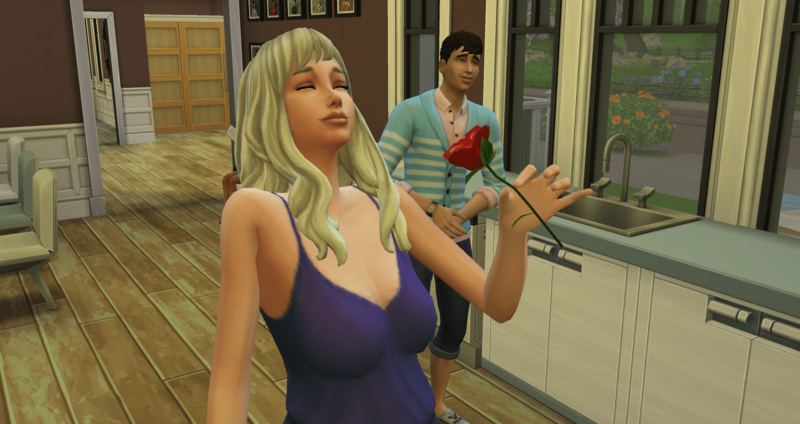 She is still on tier 3 of the Serial Romantic aspiration, trying to get 10 kisses. 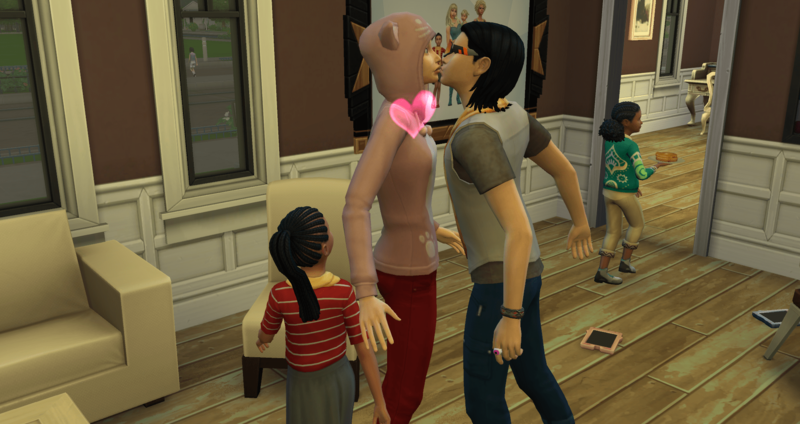 Raj is #8 on the kisses but baby daddy #9 – someone at the beginning didn’t count. And then they are getting frisky in the closet… which has the girls giggling. 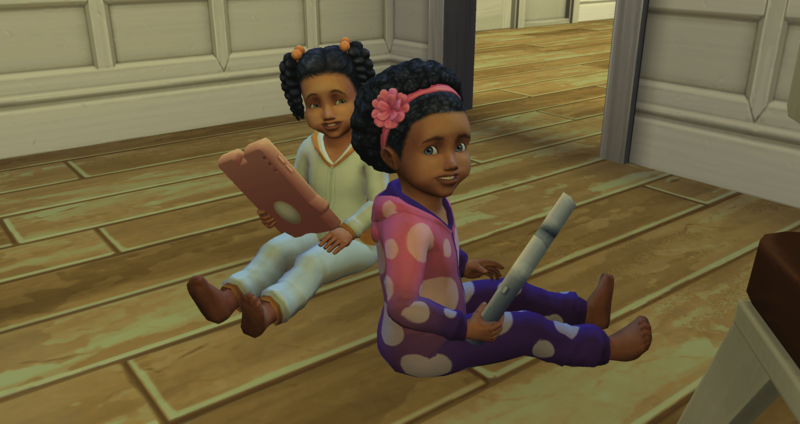 It is hard to get a picture of them giggling, and they aren’t doing it at the same time, but they definitely hear what is happening. You just got to hope they don’t understand it. It doesn’t take Merry long to repair her relationship with Mecca. 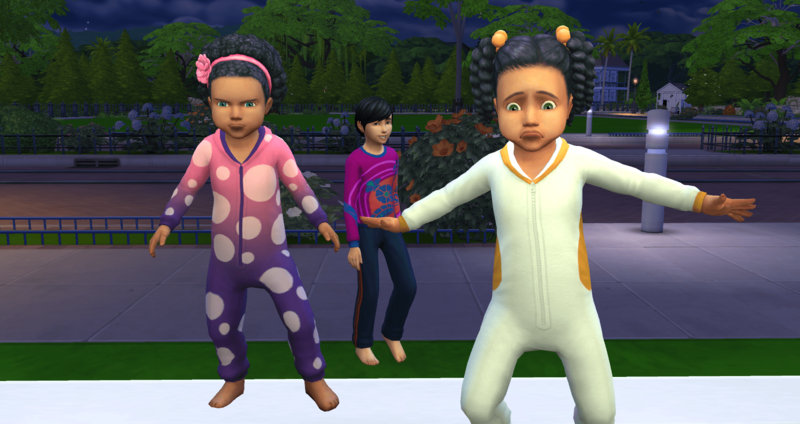 That is the good thing with toddlers – they don’t hold grudges. A funny story, some funny faces, and they are good friends again. At least until the next time Merry feels like being mean. 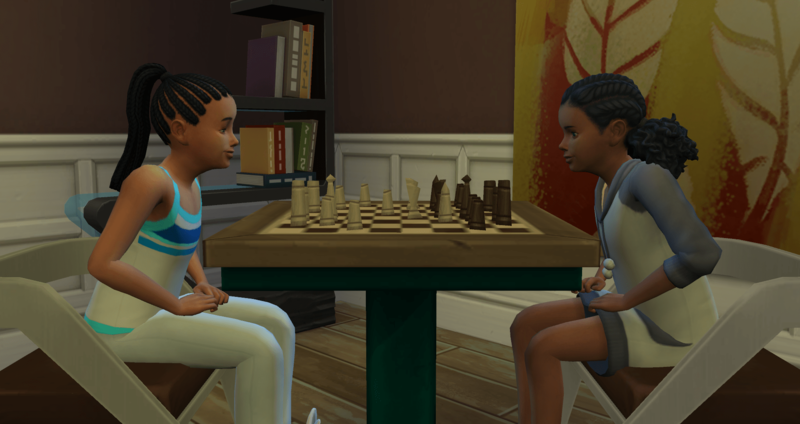 Mecca is the first of the twins to reach level 3 in thinking – she is ready for her birthday, but she has to wait for Miami to catch up. OMG – and I just thought Mecca had forgiven Merry. I noticed Merry making those weird hand movements and I realized Merry was hysterical. I canceled everything in her queue and sent her to Try to Calm Down. 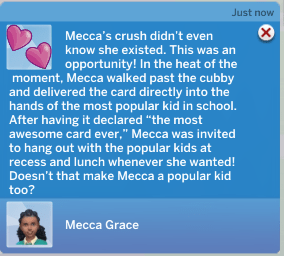 I then noticed that Mecca kept popping back into her queue with another joke. I would cancel the incoming joke and another one would pop in. It. Kept. Happening. 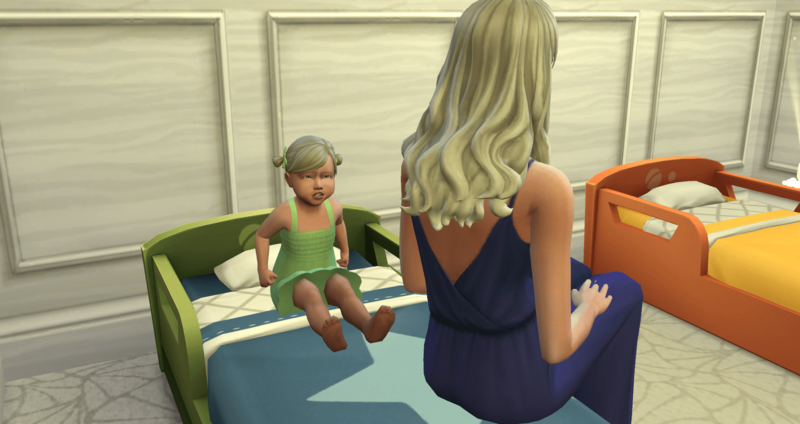 I finally got her headed to the mirror, so I went to check on one of the others, while Mecca climbed into the chair – I assumed to talk to Miami. Then I realized Merry had turned around and was heading back to the living room. Mecca had called her back to “put her down” from the chair. Merry was still hysterical – and Mecca had queued up another joke. 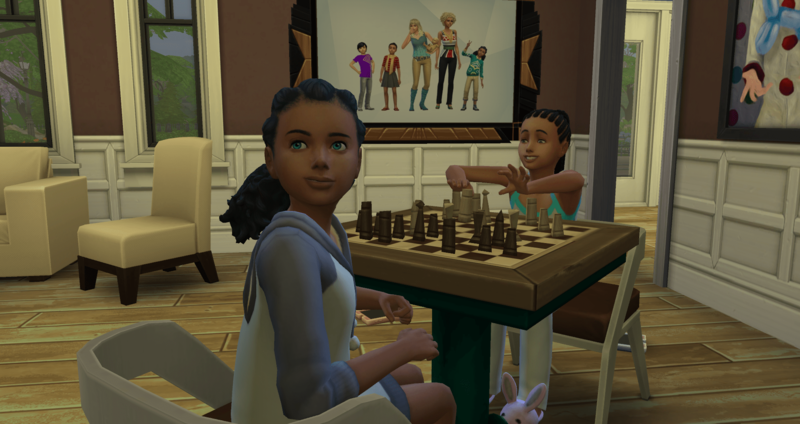 I swear the twins cooked up a plot to kill Merry by laughter. Mecca is standing there waiting for Merry to come back to “put her down” from the chair. 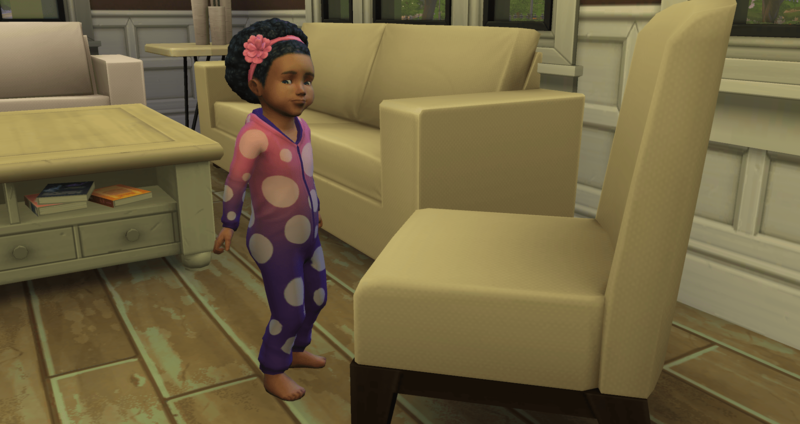 I canceled her action to “put down” Mecca and sent her back to the mirror with back to back actions to try to calm down – and I sent Mecca to potty and then to bed. 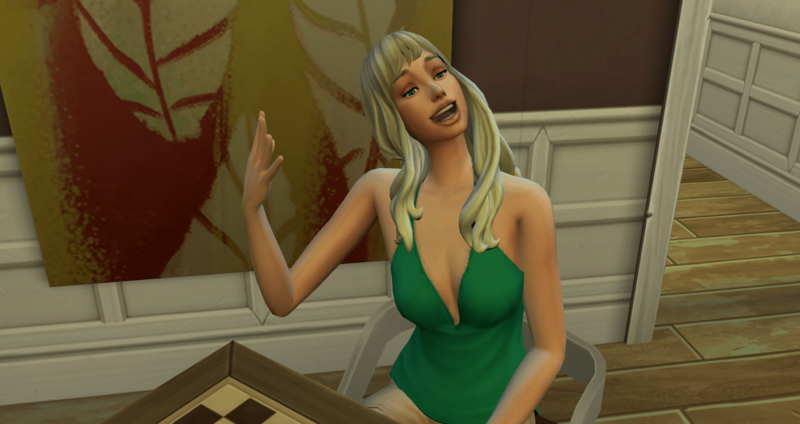 Dammit Mecca – I was focused on getting Beijing to take care of Vienna, and I look around and find Mecca telling jokes to Merry – and Merry is hysterical AGAIN. 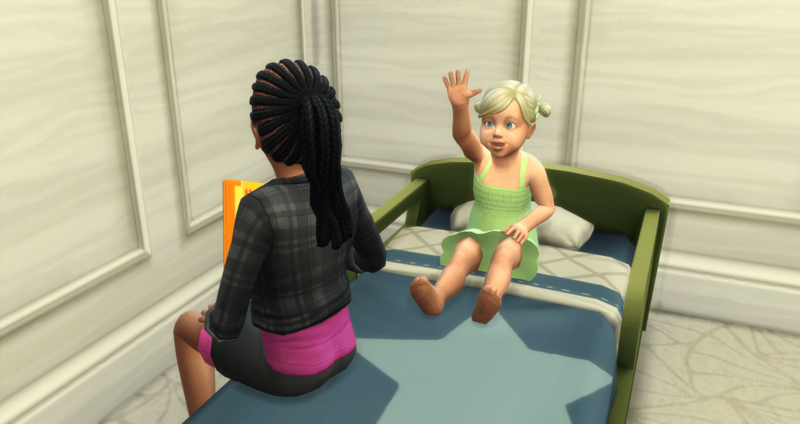 Mecca did not go to the potty – she went to her bed – and instead of going to sleep, she sat down and started telling Merry jokes. I have no idea how Merry ended up in here when she is supposed to be in front of the mirror calming down. I tell you she is trying to kill Merry. You cannot convince me Mecca isn’t trying to kill Merry. Calm the F#ck Down, Merry. Miami is looking so sweet and innocent – but I know the truth. There! Your belly is not empty anymore. Why aren’t you happy? Is it because you realized your toddlers were trying to kill you? Miami finally reaches level 3. In the process of trying to keep Merry alive, I forgot about Miami. At this point, her bladder, hunger, and energy are non-existent. I don’t even know where to begin. 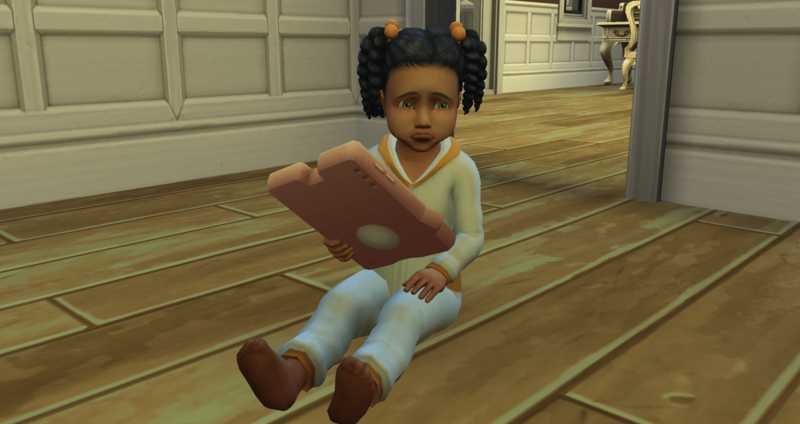 She uses the potty, then passes out on the way to bed, and then decides to go eat instead of going to bed. 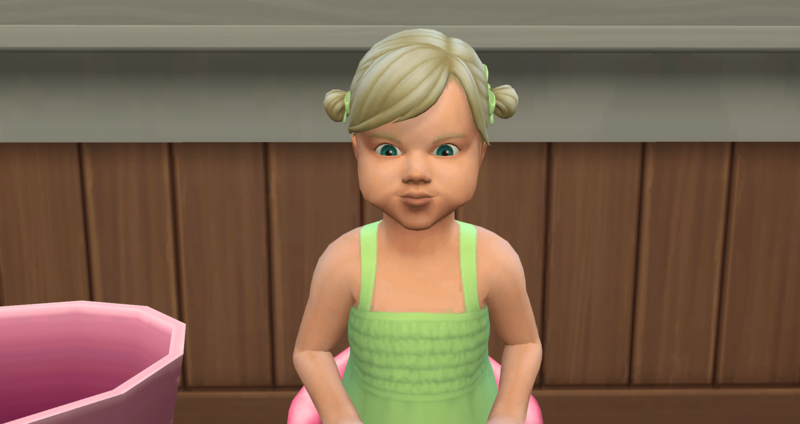 I decide to go ahead and let them have their cake to grow up. 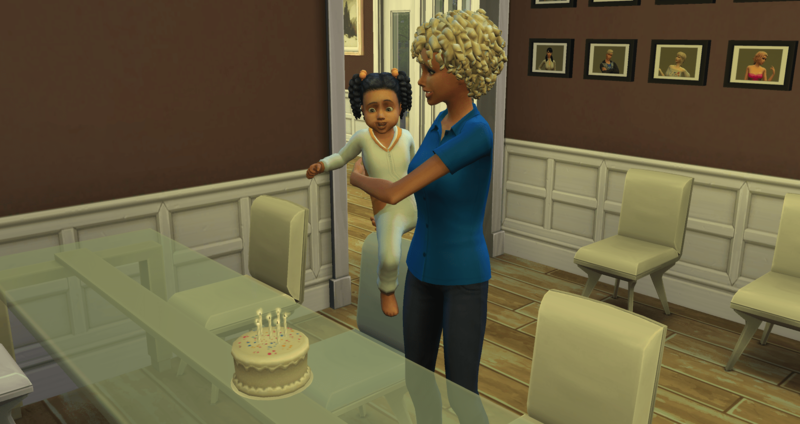 She passes out one more time before Beijing can get her to blow out the candles so Mecca gets to blow out first. It is a mess. Mecca going first – Miami has woken up from passing out, so now she gets to sit and watch and wait. Now, it is Miami’s turn to blow out the candles. Mecca grows up Mean and Whiz Kid (go figure). I told you not to piss this kid off. 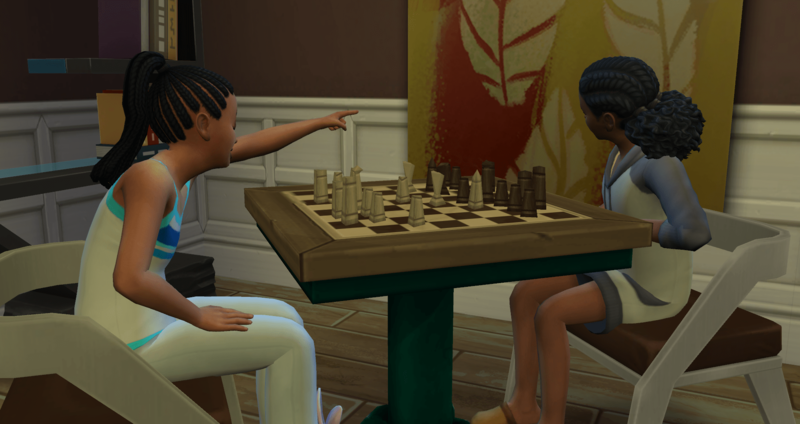 Mecca needs to play several games of chess so Miami agrees to play with her. 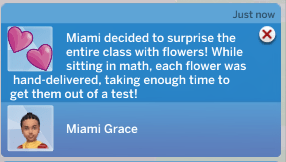 Since Miami’s aspiration is social, I doubt she will even pretend to work on hers. Although, since I already suspect Mecca tried to kill Merry, I am not sure I would be trying to cheat against her in anything. I am actually hoping Mecca rolls evil and genius. 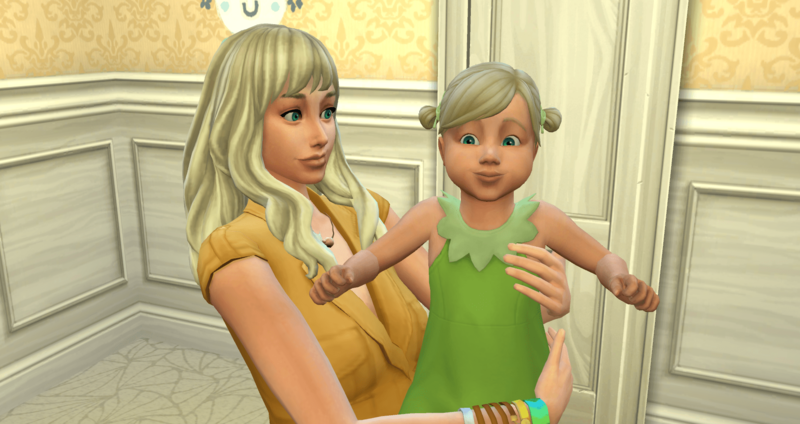 Vienna becomes a toddler – blonde like Merry and look at those chubby cheeks. Austin remains cheerful and stays out of the way. He hasn’t done anything to cause trouble and attract attention. In fact, I have forgotten he is in the house a few times. Not at all like the turd he was as a toddler. Vienna is fussy, and she is already showing just how fussy. 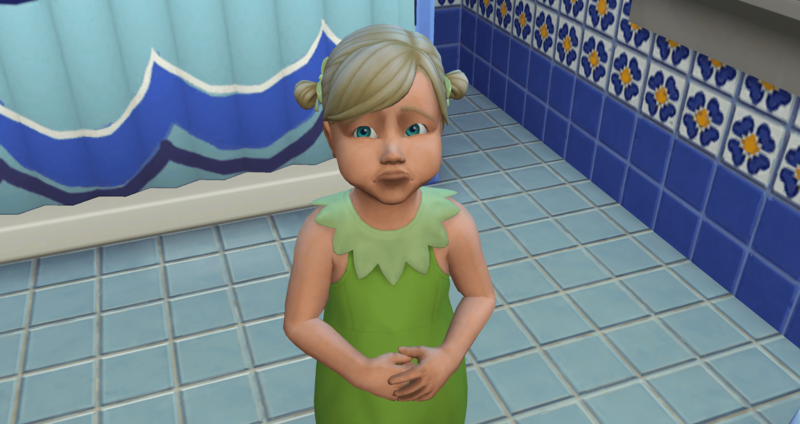 She has started off by being defiant twice on her potty training. She has only sat on the potty twice. 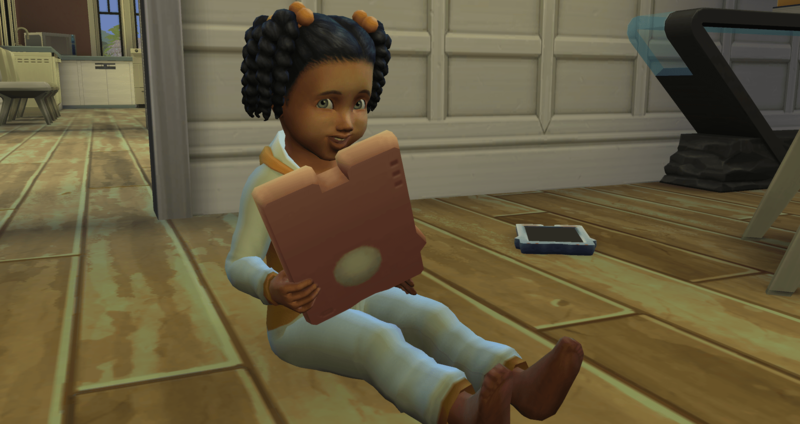 After potty training, she had some dinner, and then it was time for bed. 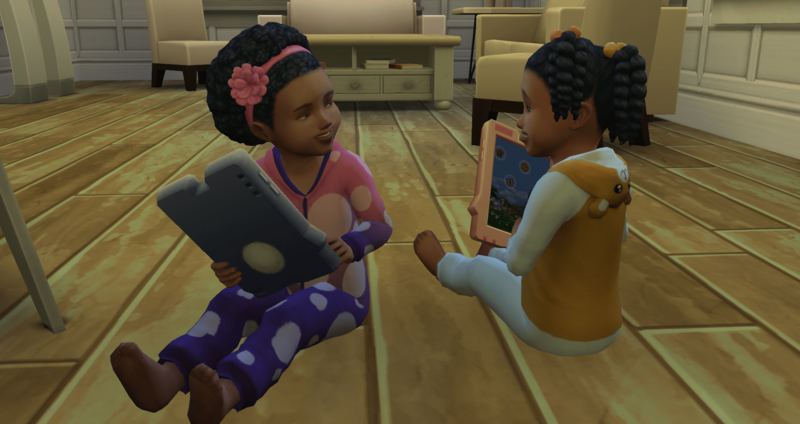 She didn’t want to listen to her bedtime story and it took two attempts for Merry to get her to bed. 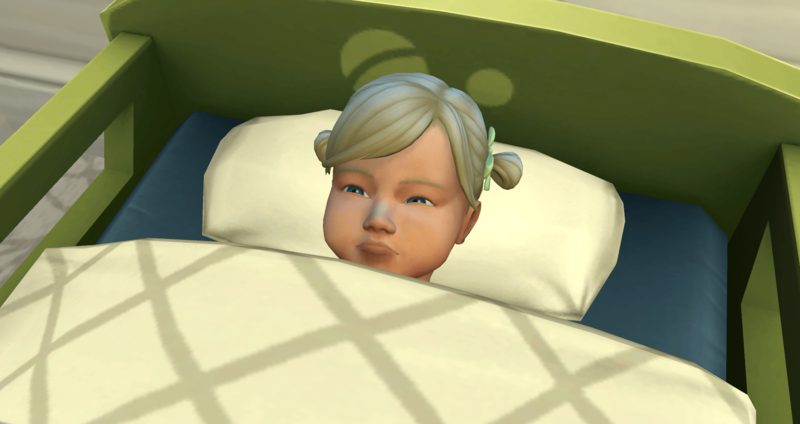 As a result, Merry didn’t make it to bed. 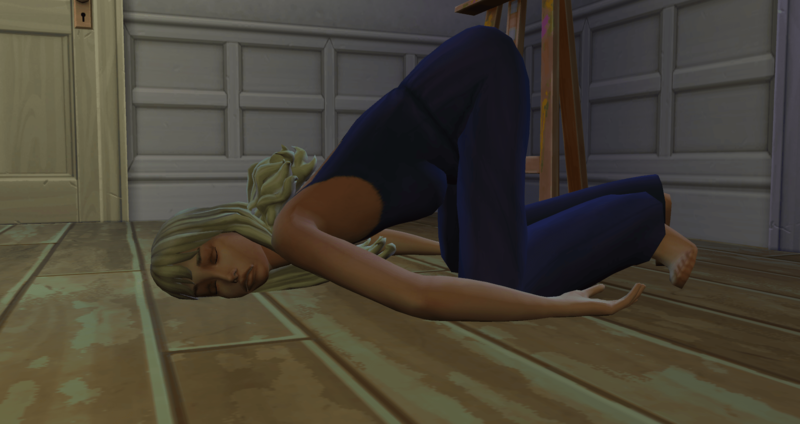 This is the first time Merry has passed out in ages. 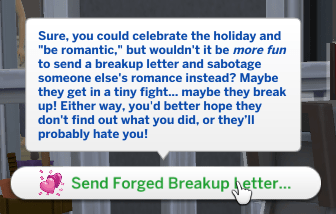 Merry’s option for Love Day… her options were 8/9 of her baby daddies, only leaving out Johnny Zest – because he never hooked up with anyone else. 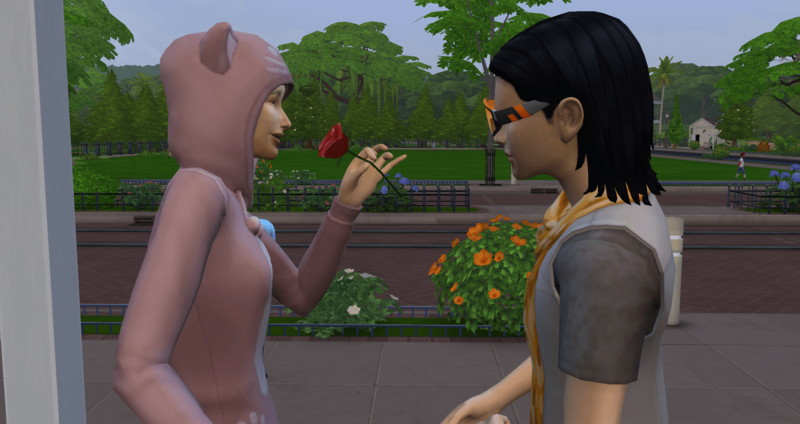 Instead of mischief, Merry invites Sergio over for some romance. 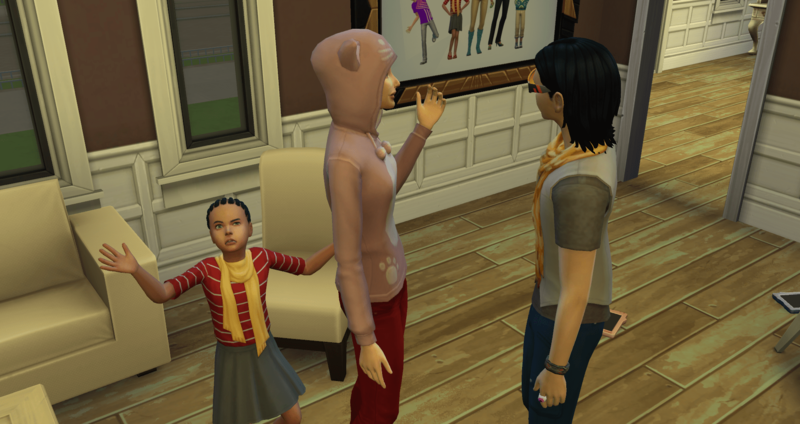 While they are romancing, in the back of the house, Fussbutt awakes… and she is already in a mood. Sergio would be a keeper, if Merry could keep him. 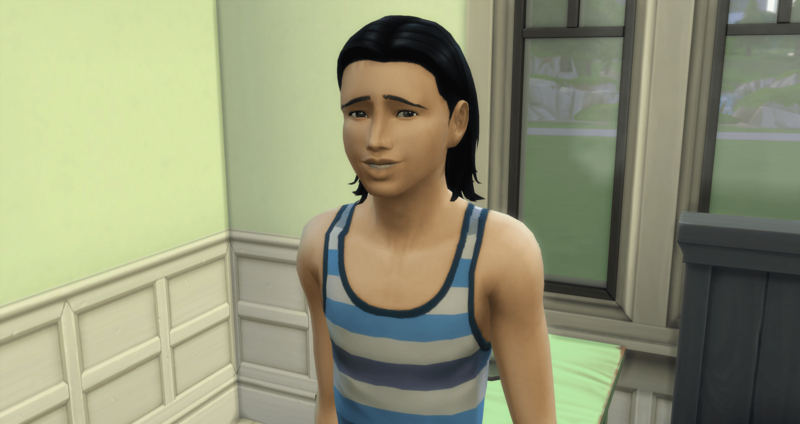 He is one of the sims I have never played with before. But he has been following Merry around romancing her constantly. Fussbutt is not quite as impressed with Sergio. But then, she isn’t impressed with anything. Except pancakes. 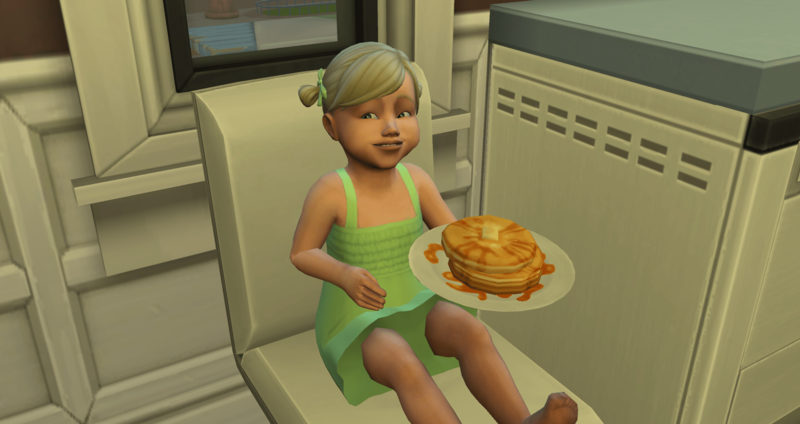 She is impressed with pancakes. Note: Fussbutt does know how to smile. It doesn’t happen often, but it does happen. 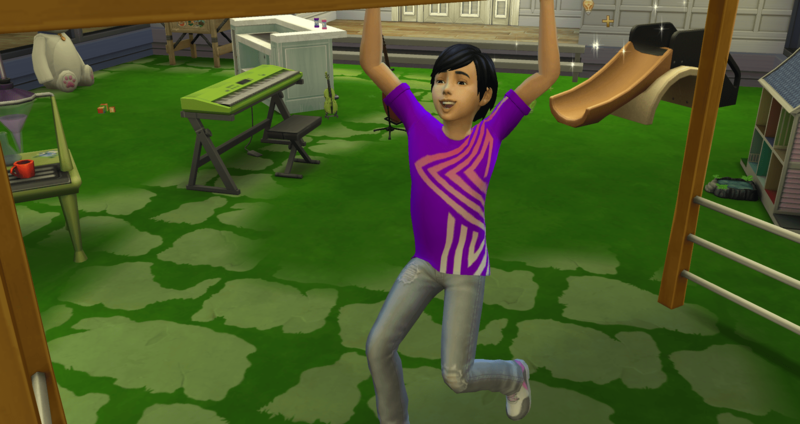 Cheerful Austin is now also a Goofball. 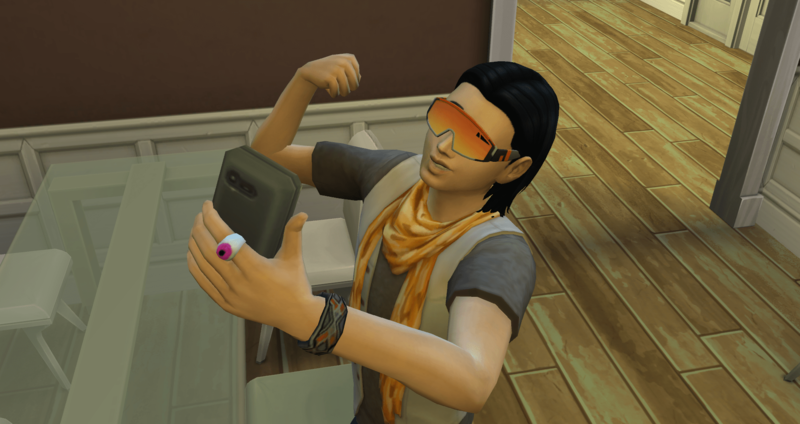 Normally I wouldn’t let them keep the sunglasses, but who knows, maybe I will this time. And he rolled Soulmate. Nah, sunglasses will be gone – I need to see his eyes. More autonomous Sergio love action – at least he is keeping Merry occupied and happy. 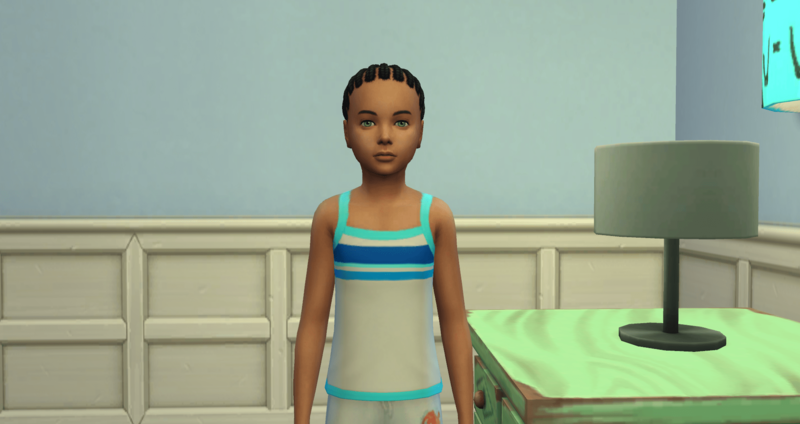 Since Austin was mostly ignored/neglected as a child, I decide to give him a girlfriend. 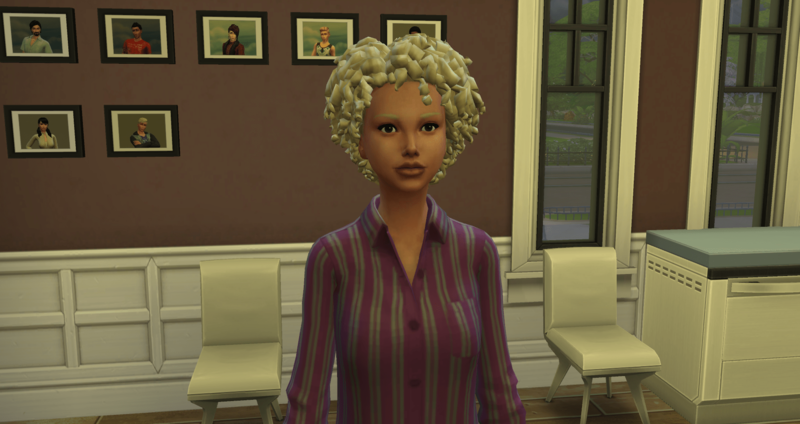 This is Katrina Benali – who is not related to him because Salim was not used a baby daddy. 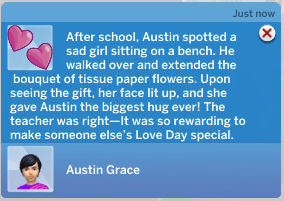 It is still Love Day, so Austin will be the only teen have a successful holiday. Well, partially successful holiday. I thought it had marked him into the gold but nope – only Merry is in the gold. It was awful for everyone else. Katrina even agrees to be his girlfriend. But there is never any privacy – especially in the living room. When I went in to remove the glasses, he wasn’t wearing them in any of his clothing categories. So here he is with his pretty eyes visible. 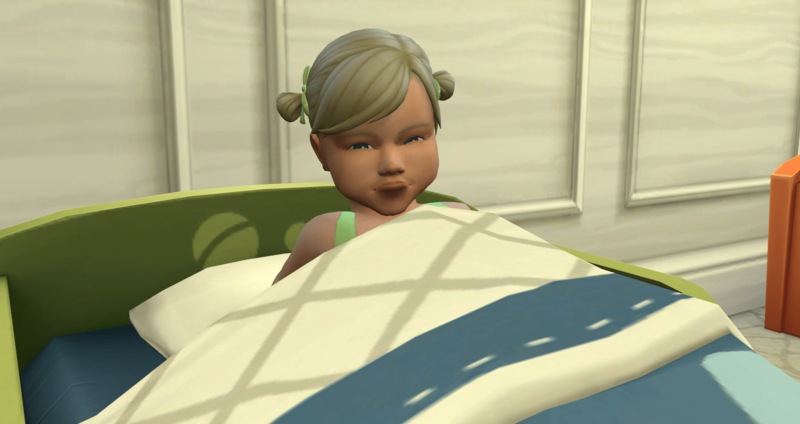 Fussbutt is awake and wanting someone (Merry) to take her to the potty. After that she had a productive day – maxing communication (hitting the stuffed animal levels it just as fast as hugging). 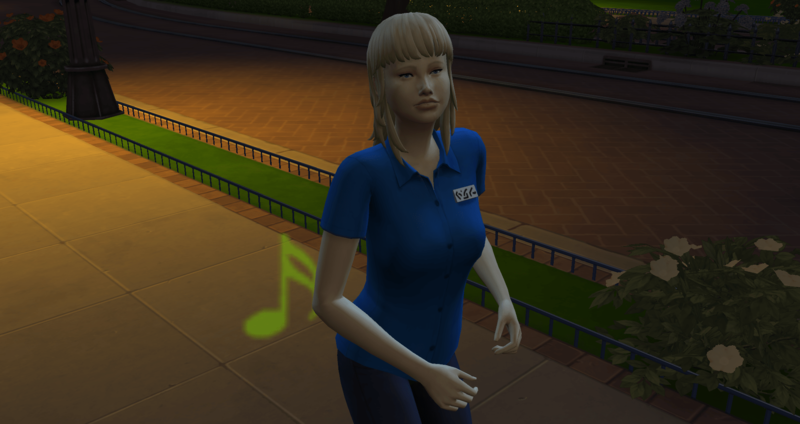 She also got movement to level 4 – now she can run everywhere. She still needs to work on the rest, but she only threw one tantrum, which is how she ended up hitting the stuffed cat. The twins spent their free time playing on the playground. They have the skills they need to get their A so they just stayed out of the way for the most part. Beijing and Austin came home from work together. Literally. Beijing brought a promotion, Austin did not. 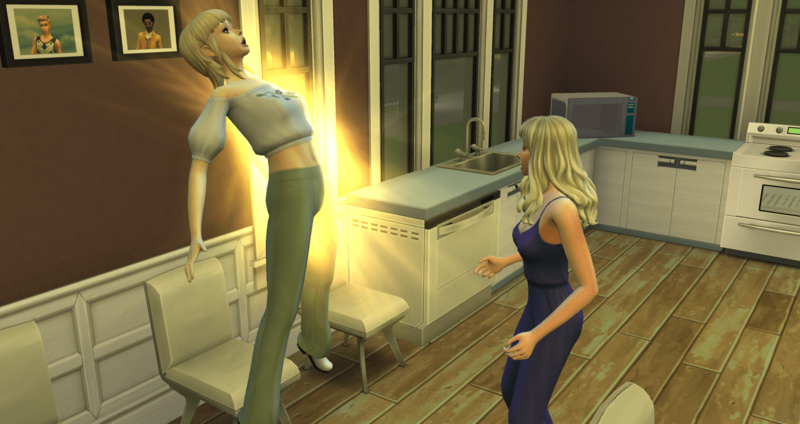 And Merry gave birth to twins, again. On Ley Line works – Fertile does not. This time she had a mixed set.